12.05.2018 Pfeiffer Vacuum's PrismaPro quadrupole mass spectrometer is suitable for both qualitative and quantitative gas analysis as well as leak detection and provides high sensitivity, maximum stability, and intelligent operation in a variety of industrial environments. 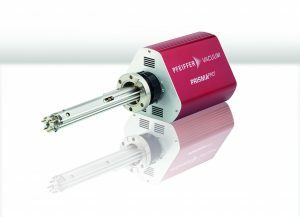 Offering a detection limit of down to 3E-15 hPa, the instrument comes with selection options for mass range (1-100, 1-200, or 1-300 amu), detectors (Faraday detectors or secondary electron multipliers), ion sources, filament materials, and integrated interface options (digital and analog inputs/outputs, or Ethernet with an open JSON programming interface). PV MassSpec software newly-developed for the PrismaPro is easy to use and offers a clear platform for capturing and visualizing measured data and parameter records. Simple routines can be quickly activated for leak detection and vacuum diagnosis and measurement tasks can be automated using a sequencer function. The software can also operate multiple mass spectrometers simultaneously.